Obviously a 24 or so hour flight from Australia to Rome is going to be a bit of a haul. As a direct flight, there’s still a four hour stopover two thirds of the way there, which is a mixed blessing. Getting in to Dubai at 5am was nice to stretch the legs, but with four hours before the transfer, there wasn’t too much to do, unless you’re obsessed with duty free shopping. When traveling big distances, you get good at waiting at least! 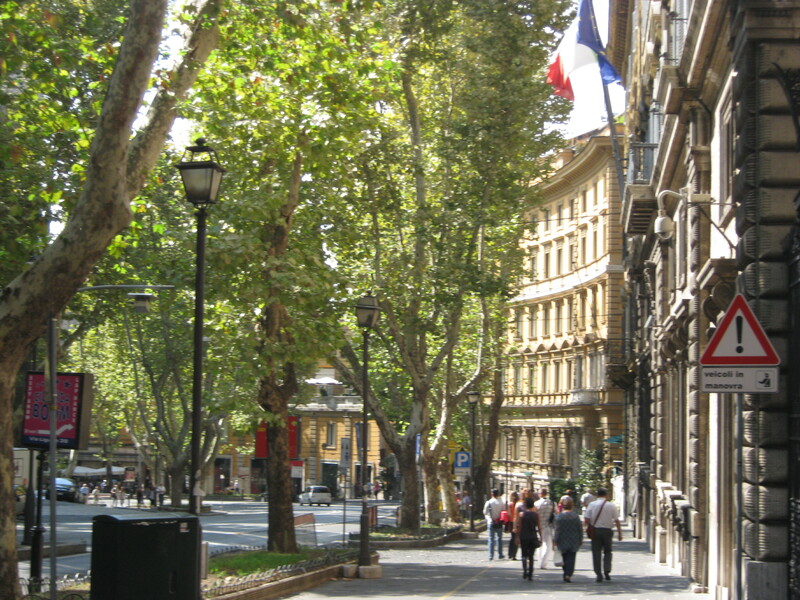 Once my wife and I actually got in to our hotel in Rome, instead of collapsing from fatigue as I thought we would, we found ourselves energised by the city. Calling Rome a ‘short’ city might not make sense, but in the historic city centre there are few buildings taller than 6 or so storeys (if I remember right) – compare that to Melbourne or other ‘young’ cities and you get the idea. And as every other building is architecturally inspiring, there’s a wonderful feeling of strolling down the cobblestones of a piece of living history. I know that’s a cliché, but it’s an old city and one that has resisted crass, neon facelifts for many years, and is all the more amazing for it. 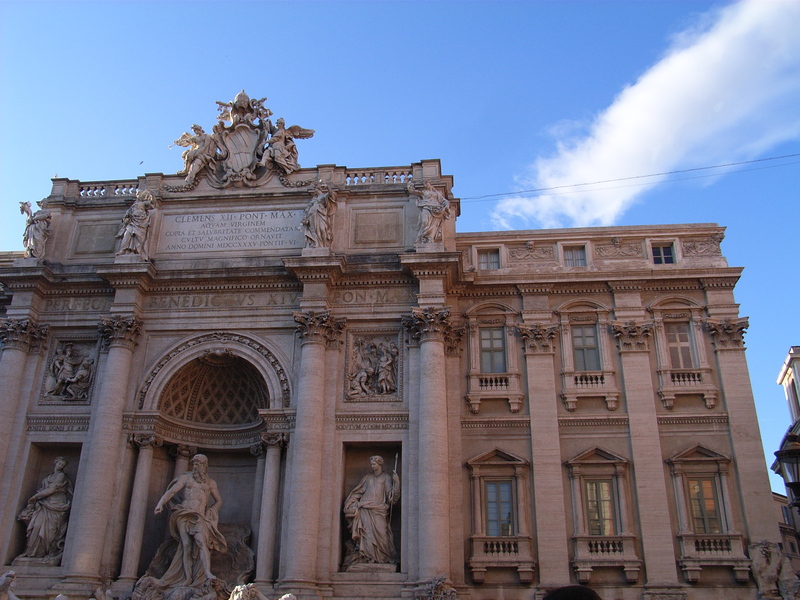 The first place we went looking for after consulting a simple map, was the Fontana Di Trevi. From Via Veneto it’s only about a ten-minute walk and so we charged down the streets, finding it easily enough, the steady flow of visitors helping out. Once we were close enough the rush of water sort of pulled us around a corner and into a narrow square lined with gelati shops and packed with visitors. It’s hard to place it into words, but the 26 metre-tall fountain covers the lower portion of the Palazzo Poli and demands your attention where it rises out of the water, Tritons looking on with some sense of proprietorship. Even as we gaped round the corner, moved down and settled at its feet to watch people throw thousands of euros over their shoulders into the water, the fountain seemed to clear the square of voices. I could stare at it and hear nothing, see nothing of those around me (until someone bumps into me) and just let the sound of the water fill the air. Actually, it was hard to imagine it red – as is was for a time in 2007 – it’s so beautifully blue. 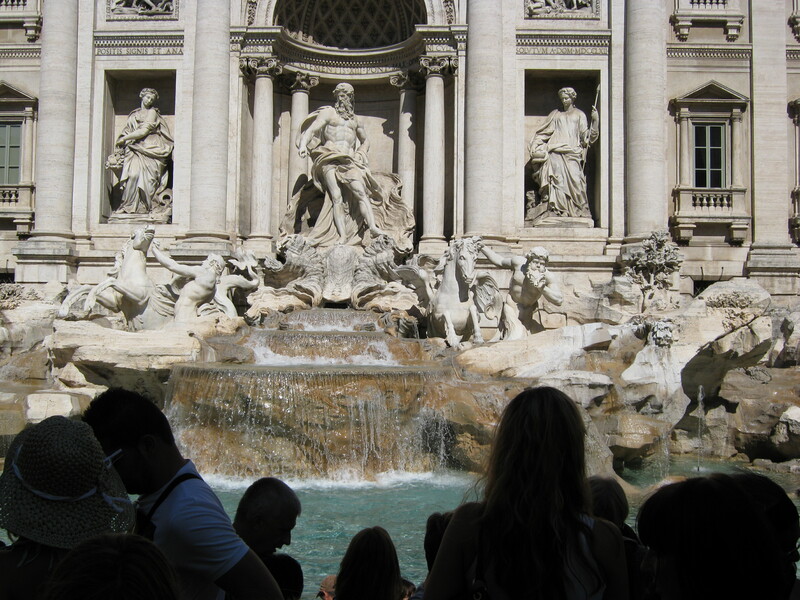 Even though we’d expected them at the fountain, there were no beggars there, they were usually found elsewhere. Compared to the hawkers, they were hardly aggressive. They’d go for pity instead, sometimes with quite transparent efforts, lying on the cobblestones with a small child curled in arm beside a cup (often at churches), or by prostrating themselves half in the gutter/half in the street, hand outstretched with a face to the concrete. There they remained still and made no sound. Some had signs, some did not. One we saw had just fame written large. Perhaps unsurprisingly, I saw only a small amount of people donate, and though we did at times, you couldn’t help but wonder if a coin or two would make much difference. Love that haiku 🙂 I have been to Rome several times and it is so wonderful – the history, beauty and saturation of art are overwhelming to the senses. Though at night I remember so much noise (fighting in the streets, breaking bottles etc.,) keeping me awake in my hotel. Thanks Gabrielle – sorry about the delay in writing back – I’m jealous, several times! I already want to go back. No need to be jealous – each time was a very short visit – one when I was 9 so didn’t appreciate it at all (except the pizza 😉 ); another when I was with my Mum in my twenties on our way to Croatia (but we did have a tour guide which was helpful); and one other time just for a couple of days – I’d like to go for a longer time. If you like crime shows there is a new one on tv called Zen (only 3 episodes) which is set in Rome – I love it! Fantastic Ash, and that haiku is a perfect close to the piece, really drills the image home. I’m trying, Graham, it’s hard but I’m definitely doing my best. Hoping to post something new in the next few days. Rome again, or maybe Amalfi.